Clinical labs need to be able to process samples down to a short list of variants and publish a professional report. VSReports helps scientists and clinicians alike create timely, actionable reports that can improve clinical decision making and streamline patient care by seamlessly incorporating the results of tertiary analysis into a customizable clinical report. Reports are fully customizable, containing focused and actionable data. 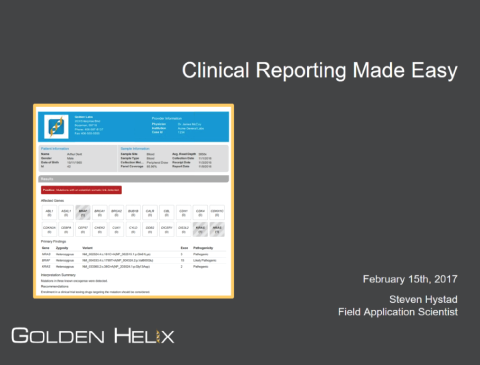 Additionally, reports can be branded and styled to match the documents that your lab typically produces. With tight integration to your analysis results, you can also pull in additional annotation sources relevant to the sample being tested. This webcast will walk through preparing a template for report generation, reviewing the generated report and performing some report customizations. 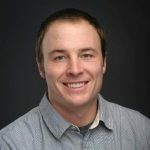 Steve Hystad joined the Golden Helix development team in November of 2016 as a Field Application Scientist. Prior to that, Steve worked as a Regulatory Affairs Specialist and Molecular Biologist. Steve earned his Masters in Plant Genetics from Montana State University in 2014. As an FAS, Steve works on data curation, customer support and VSReports. When not working, Steve is skiing, hiking, rafting or searching for Forrest Fenn's treasure.